This traditional Christmas tree has been decorated with silver foiled baubles and swathes of silver foiled ribbons. 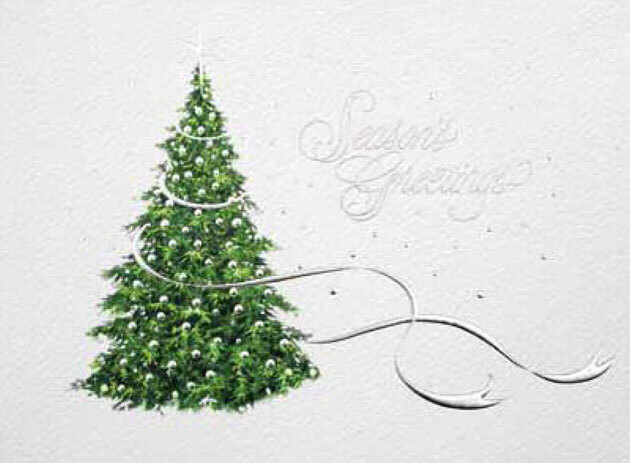 Printed on a matt white textured board, the message 'Season's Greetings' is printed in silver foil, top right of the card. Please request a free sample of this design to see the silver foiling, which does not come though on this web image. By purchasing the Ribboned Tree Christmas card 10p for each card you purchase will be Donated to the Charity of your choice from the Charities listed below.